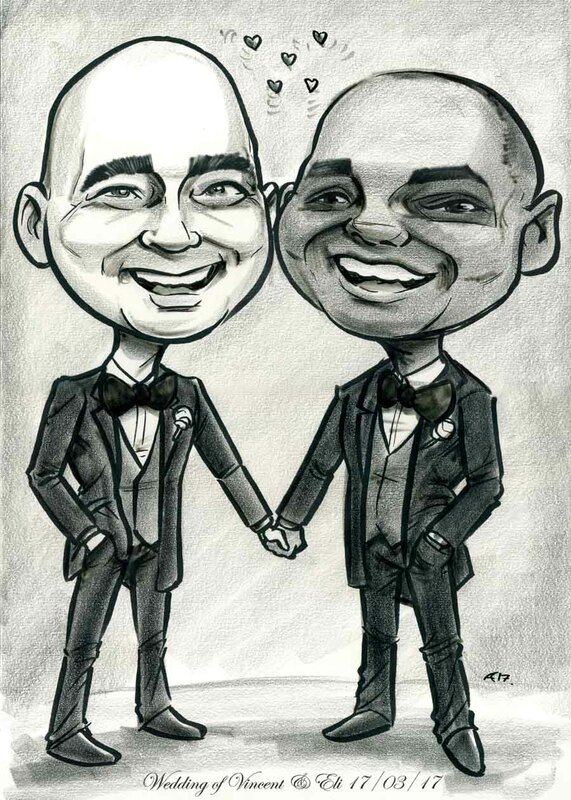 Caricature Wedding Presents by Allan Cavanagh delivered all over Ireland! Black and White Caricature Wedding Presents! There are a number of options available. These range from black and white head and shoulders @ €50 right up to framed A2 full body caricatures in colour. The latter includes jokes, hobbies, pets, and other details. I deliver all over Ireland and the UK too! If you don’t see what you’re after in the options on my order page just ask. I can tailor to suit your needs. After you’ve selected which caricature you’d like I work from recent head and shoulder photos supplied by you. I can incorporate whatever details you’d like included. I then work to completion within a 2 week time-frame, but can turn them around faster if required. Just ask when making your enquiry. Order a caricature from Allan Cavanagh here. If you have any questions you can contact me 24 hours a day via my contact page.